This is Gil The Gecko (on the left) and his best friend, Sam The Salamander. Check out Gil's Puzzle Fun! More games and fun coming soon! Jayne says: "Gil The Gecko is a character from my very first children's book, written in English and Japanese! I wrote the book while living on Okinawa in 1994. Geckos are plentiful on Okinawa and help keep the nasty bugs in check. They lived in our base housing quarters and climbed the walls, visited me in the kitchen while washing dishes, and were just plain cute (see photo). After finding myself talking to one, I decided a story about a boy gecko and his adventures on Okinawa would be perfect!" In June of 1995 the book was self-published on Okinawa and was an instant success -- it sold out within two weeks! Currently, Jayne is looking for an agent to represent her or a publisher for her proposed series about Gil The Gecko. KIDS - If you want to see Gil The Gecko in print, sign his Dreambook and let him know! "Gil The Gecko, a truly excellent Okinawan adventure. Look for this one on bestseller lists everywhere." - FEN- TV (military television), Japan. Gil The Gecko Fan Club Wins Award! 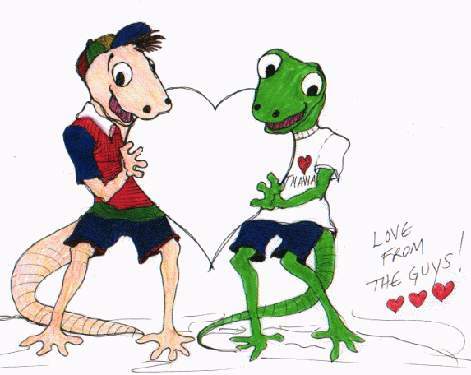 Author Jayne A. Hitchcock won the Grand Prize in the national Quill "Showcase Your Talent Contest" in October of 1995 for her design of the Gil The Gecko Fan Club membership kit. Want to color in your very own Gil the gecko and his friends? Print them out and color them in! Comments? Questions? E-mail Gil The Gecko today! Go back to Jayne A. Hitchcock's Page. COPYRIGHT NOTICE: Editorial text, stories, photographs and graphics 1995-2003 by Jayne A. Hitchcock, unless otherwise indicated. Gil The Gecko illustrations by Debra H. Duddleson. All rights reserved. Permission to download the contents of these pages for personal use is granted. All other use including copying for nonprofit or commercial purposes is prohibited without written permission from the author.